Features Fixed, Two Column, Blue, Right Sidebar, Business, Ads, Slider. 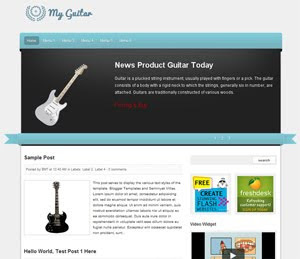 Descriptions My Guitar is free blogger templates related about business and very good for sell a product, but this themes not have feature shopping cart and you can find code or some plugin to do that. Blue and gray is main color for background this themes, ads spot and slide for feature post very good to see.